Established in 1882 by a small group of Benedictine monks, the Mount Angel Abbey is sited on a bluff overlooking vast tree lines and meadows of the Willamette Valley, just 40 miles south of Portland, OR. The 1920s church and monastery was built on the site of two previous monastery buildings that had each, in turn, been destroyed by fire. The Abbey has since added several buildings, including a library designed by Finnish architect Alvar Aalto, forming a quadrangle at the heart of the hilltop community. 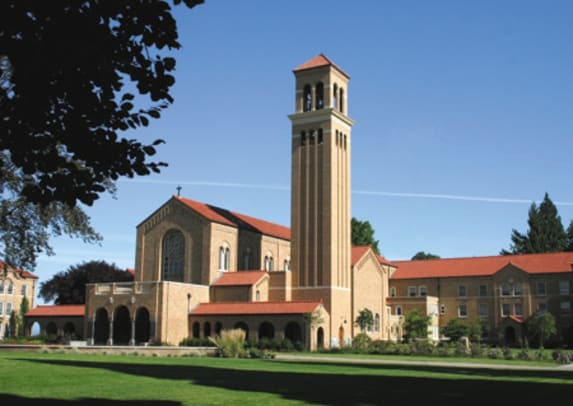 In 2006, the Abbey worked with Soderstrom Architects of Portland, OR, to develop a master plan that involved relocating parking off the hilltop and designating sites for a new bell tower, seminary building and other residential structures. The firm was subsequently awarded the contract to design a 110-ft.-tall bell tower housing a peal of eight cast-bronze bells. The Abbey has had several bell tower proposals but the project was never completed due to the lack of funds. 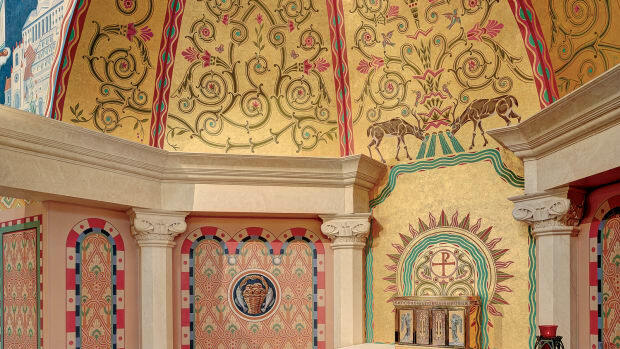 "When we went into their archives there were pastel sketches of the front of the church with what might have been a tower from the 1920s," says project designer and architect Andrew Burke. "There were also schemes from the 1950s and from ten years ago. The bell tower was really something the Abbey had imagined for the entire time. We wanted the new building to look like it had always been there, as if it were part of the original design of the monastery church." "The building sits behind the entrance portico of the church because we felt that was a humbler position for the bell tower and it became apparent that we could solve some other problems," says principal in charge Henry Fitzgibbon, AIA. 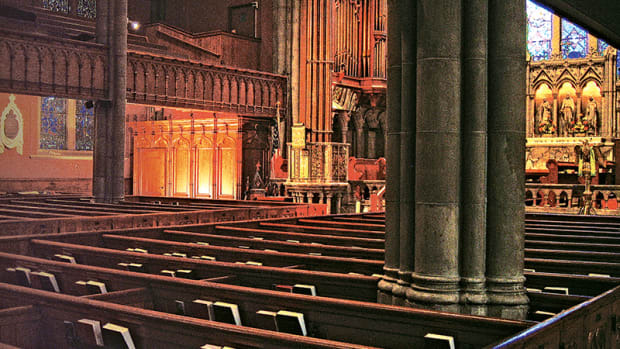 "The church didn&apos;t have public restrooms or accessibility to the triforium level and the seminary chapel in the basement. The bell tower&apos;s placement solved these ADA issues and provided new restroom facilities – it&apos;s sort of an all-in-one package." Although the collection of existing monastery buildings doesn&apos;t adhere to any specific style, Romanesque details on the main church, such as the corbelled brick cornice and arched openings were repeated on the bell tower. New elements were also introduced to the design. The four elevations feature brick flutes connecting to a series of three arches directly below a Tuscan entablature constructed of GFRC (glass-fiber-reinforced concrete), which was treated with a glaze developed by Portland, OR-based Architectural Reproductions, to match the existing terra cotta. Double arches below the salvaged-clay tile roof are juxtaposed against smaller arches to maintain a balanced appearance between the taller height of the tower and the adjacent church. Repeating the color scheme of the brick exterior, which matches the church and monastery building, required sourcing brick from three different manufacturers. "Normally, brick comes out to the site premixed and blended so you don&apos;t get big blotches of color but that&apos;s when it&apos;s coming from one manufacturer," says Burke. "We had a mason willing to blend the bricks onsite because there were six different colors of brick. It&apos;s a very subtle mix of colors and we were able to get a good brick match." A concrete tilt-up structural system was selected for its ability to support the acoustics and weight of the eight bells. The 40-ft.-long concrete panels were cast onsite, hoisted into place and positioned in a staggered, self-supporting configuration. "The reason we went with a concrete tilt-up building was because we could not get the rigidity we needed out of a structural steel frame," says Fitzgibbon. "If the bells move even slightly the tone changes and the largest bell weighs over 8,000 lbs. so it would have moved too much with a steel structure." In the base of the tower, an elevator provides access to the seminary chapel in the basement, the narthex and the triforium and monastery. "That was important because there was only one elevator and it&apos;s beyond the public area," says Burke. "It created a problem for visitors who wanted to see monks who were in the monastery infirmary – there was no way to get them there. The triforium connects to their infirmary so the elevator in the bell tower provided a new point of access." Respecting the monastery&apos;s tradition of emphasizing plainness, the restroom and elevator lobby areas were kept basic. The tower shaft interior contains utilitarian ladders for maintenance of the bells. The service entry features a custom-designed teak door and light fixture, the latter of which was fabricated by Exton, PA-based Ball & Ball. 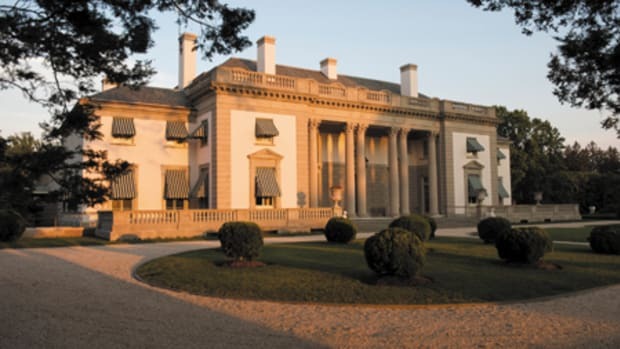 "The program was fortunately generous enough to allow for certain custom-designed elements – the door and lantern – mainly because the bell tower doesn&apos;t have that many features so we wanted the few things that we have to be as memorable and appropriate as we can manage," says Burke. The cast-bronze bells were fabricated by Aarle-Rixtel, Holland-based Petit & Fritsen Bell Foundry and were installed by Cincinnati, OH-based Verdin Company. Bricks were laid by Woodburn, OR-based Clem Fleck Masonry and were supplied by Bellevue, WA-based Mutual Materials; West Jordan, UT-based Interstate Brick; and Canton, OH-based Belden Brick. Other suppliers include Richmond, CA-based Maguire Iron Corp. (decorative iron hardware); and Farmington, CT-basedOtis Elevator. The general contractor for the project was Portland, OR-based Robert Grey Partners.